Note: PSQLv9 has been discontinued by Pervasive. Quantities remaining and prices are subject to change. If possible, please look at obtaining Actian PSQL v12 or Actian Zen v13 instead. The Pervasive PSQL v9 Server Engine is designed to host larger, multi-user systems storing data in the Microkernel format, also known as Btrieve. It is expandable to grow as your business grows. If you have fewer than 5 concurrent users and do not need this growth capability, check out the PSQLv9 Workgroup Engine instead. 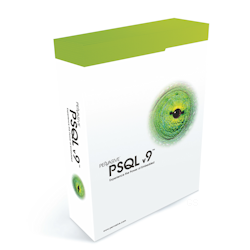 PSQL v9 licenses will work on any platform (NetWare, Windows, or Linux). This engine is licensed by using one "base" license per server, indicating the number of concurrent users that will be accessing that server. Standard license counts are 6, 10, 20, 50, 100, 250, 500, and Unlimited. You can add more users to an existing server with by adding another license to it. Each engine license can be legally installed to ONE server at a time. All workstations in the network get the free PSQL Client installed and need not be licensed.